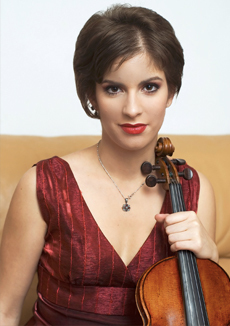 Ioana Cristina Goicea, born in Bucharest, has won numerous international competitions, most recently the Michael Hill Competition and the Carl-Flesch-Prize, both in 2017. She has performed in Amsterdam, London, Vienna, Bucharest, Auckland, and Tokyo, and she has appeared at the Schleswig-Holstein Musikfestival, Shanghai International Arts Festival, Heidelberger Frühling, and the Hamburg and Trieste Chamber Music Festivals. This is her first appearance at the Rome Chamber Music Festival.Ms. Goicea has appeared as soloist with the George Enescu Philharmonic Orchestra Bucharest, Auckland Philarmonia, Baden-Baden Philharmonic Orchestra, Südwestdeutsches Kammerorchester, Romanian Radio National and Chamber Orchestras, Norddeutsche Philarmonie, I Virtuosi Italiani, and Kunitachi Symphoniker. Her chamber music performances in 2017 included the New Masters on Tour series with pianist Andrei Banciu. Ms. Goicea’s career has been supported by many Stiftungen in Germany throughout these years. She plays a Giambattista Guadagnini violin (Parma, 1761) loaned by the Federal Republic of Germany.